There are endless articles on Newtonian telescope collimation all over the Internet. A recurring theme is that plain laser collimation is not the best option since Laser Collimators should be collimated first and most have poor collimation out of the box to begin with. This is probably true and I am not arguing with although my Baader Planetarium Colli SC actually was near perfect out of the box. Here are a few thoughts on the subject while I was toying with collimation methods on my 8" Meade Schmidt-Newtonian LXD75 SN-8. This articles is intended to explain why the SCA Laser collimators (Self-Centering type) are not the answer and IMHO are over-hyped. Collimation is the process of aligning the optical axis of each optical component in a common optical axis for the entire instrument. In a Newtonian telescope this means that the Primary Mirror optical axis should align with the eyepiece optical axis perfectly. The secondary mirror which is on the light's path has to be angled properly to match both axises. The tilt angle of the secondary serves to position the eyepiece's optical axis in the physical center of the primary. Then the primary is angled to align the direction of the optical axis so it will match the one of the eyepiece The eyepiece is the reference point since the position and angle of its optical axis is not adjustable, but the other two components - both mirrors can be angled and moved in the case of the secondary. Each component in the system - human eye, lenses in eyepiece, secondary, primary mirror and the light from an object should be treated as vectors - they have XYZ position and direction! For a laser collimator, collimation means that laser beam should be perfectly centered and parallel with the collimator's mating barrel axis. When inserted in the focuser, it mimics an eyepiece, and its the reference for the entire collimation process - again, a vector connecting and starting from laser LED, located in the XY center of the barrel and exiting the barrel at zero degrees from both X and Y. If there is a slight angular error, it will manifest as much larger linear value after it travels thru the entire OTA system. An eyepiece is secured in the focuser by either a thumb screw(s) or a compression ring. In both cases, the eyepiece's barrel OD is a tad smaller than the focuser's insertion tube ID to facilitate easy insertion. When secured, the thumb screws push onto the barrel, pressing it against the opposite wall of the focuser, thus offsetting the optical center of the eyepiece inside the fouser tube. (same goes true for the compression ring btw, contrary to the believe that the compression ring grabs the barrel with the same force all around). Here is the main problem with Self-Centering Collimators - they do work as stated - rubber rings around the barrel are compressed and expand evenly, centering the barrel inside the focuser tube which is fine, except for the fact that your eyepieces does not employ the same self-centering technique. 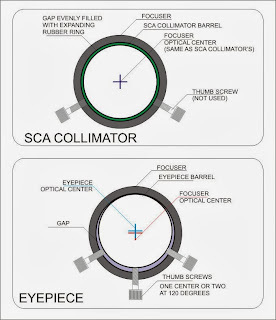 When you collimate the telescope with a SCA collimator, you reference the entire optical system to a perfectly centered eyepiece, but when you use an actual eyepiece, the compression ring or thumb screws will push it to the side and create miss-alignment. 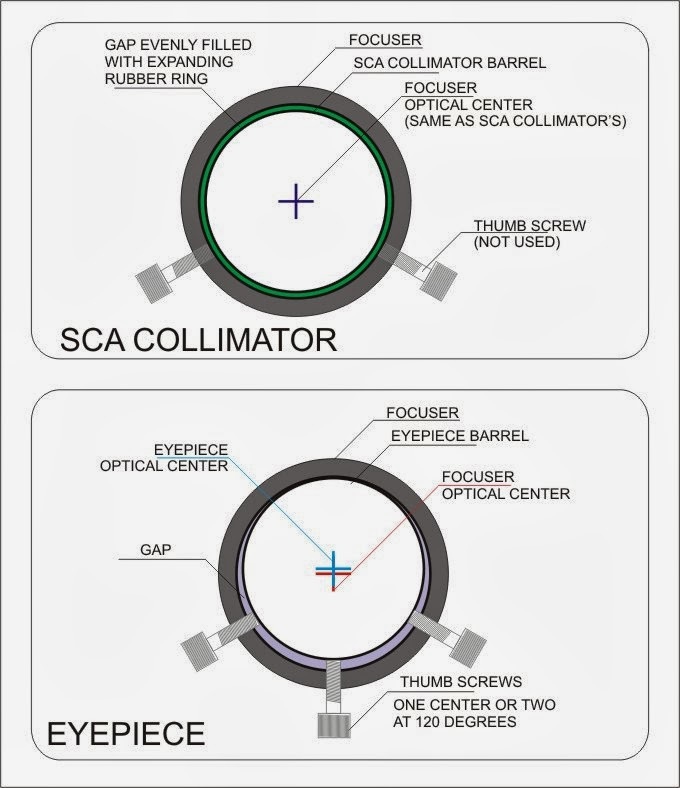 Here is an article by Hotech USA describing the issues addressed by the SCA collimator. In fact, while they do solve the centering problem, they create another one by creating an optical axis which, while perfectly centered in the focuser will never match the one of the normal eyepiece when placed and secured by normal means. What is the answer to the problem with securing and using a laser colimator, besides having the laser collimator collimated - make sure that the OTA is horizontal, the focuser is pointing straight up (90 degrees from the level OTA), place the collimator in the focuser tube and let it rest with its shoulder flush with the top surface of the focuser, tighten carefully but firmly the thumb screws (if two thumb screws are used by the focuser, tighten the first screw until it makes contact with the eyepiece / collimator but its not too tight, tighten the second screw at 100% force and go back and re-tighten the first screw again - this will re-position the eyepiece properly) and lastly, dont touch or wiggle the collimator or move the OTA during collimation. Collimator should emulate an eyepiece, including the way it is positioned and secured in the focuser, not introduce a completely new method for centering, which can not be ever achieved with an actual eyepiece. Who cares about repeatability between collimator insertions when it can not be repeated with an eyepiece? The best is to incorporate the self-centering mechanics in the focuser itself - hear that Moonlite? Or instead of using thumb screws / brass compression ring - use a deep/long wedge with 120 degrees of eyepiece barrel curvature and two angled radial thumb screws near the edges of the wedge.